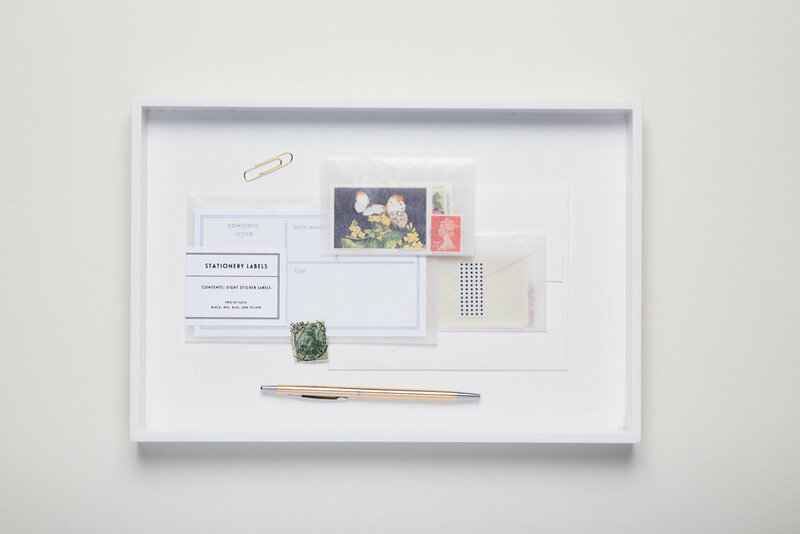 Over the past few months we've had the sincerest pleasure of working behind the scenes with Julia Neises of Eva Moon Press to bring our Letter Writing Essentials to life. Now that the kits are out in the world, we're taking a moment to slow down and chat with Julia about her letter writing journey, her ephemera collections, and the inspiration behind her stationery labels. A shot of Julia's stationery labels for our Letter Writing Essentials collaboration. When and how did your letter writing journey begin? As a child, I loved to receive mail from my grandparents. They always sent cards for my birthday and Valentine’s day. Because I didn’t see them often, it felt so nice to be remembered and have that special connection through the mail. Also, my grandfather’s perfect penmanship inspired me to work hard at my own cursive. I like to encourage beginning letter writers by saying that I haven’t always been good at keeping in touch, but it’s something that can be worked at and improved with a little discipline. What does your letter writing process look like? I respond to letters in the order they are received (stored in a daschund-shaped spiral letter holder on my desk). I use the Letter Ledger from Paper & Type to organize my thoughts before I begin. Then, I select my stationery and writing utensil (usually a fountain pen). Once I’ve written the letter, I choose my stamps and address the envelope, adding other flourishes or decorations as needed. I tend to keep things simple, but still spend at least an hour preparing a letter from beginning to end. Aforementioned daschund-shaped spiral letter holder on Julia's desk. The next two questions are borrowed from a photographer friend of ours; we thought they were so good that we had to pass them on. What is the most interesting, important, or emotive letter you’ve received or written? Letter writing, for me, is a way to share in the joys and sorrows that make our lives interesting. Sometimes the letters I receive share news that makes me laugh or cry. Real connections happen when we share those moments and I treasure the ways that we can strengthen each other. I am grateful for the women across the world who have shared their lives with me in their letters, be it the witty reflections on everyday details or the sorrow of losing a loved one. Finding our way through the day-to-day knowing there is someone on the other end of our letter who will read and cherish those personal moments is a treasure. Isn’t that the true goal of friendship and correspondence? Trends come and go so when it comes to aesthetics it’s best to be yourself. One bit of advice given to me was to ask interesting questions that keep the conversation flowing. This will help you learn about your penpal and give them something to write about in their reply. One of my favorite questions to ask of penpals in other countries is a query about how the postal system works in their country. Snail mail goodness from @evamoonpress. If you could correspond with anyone, whom would it be? My great grandmother, Eva Moon, who I never met. She grew up in Nebraska and moved to Oregon with her growing family during the Great Depression. She was born in 1892 and I wish I could hear tales of her childhood and Swedish heritage. Tell us more about the inspiration and design for your stationery labels. My labels were completely inspired by vintage ephemera. I gave them a modern twist by setting the text in sans serif typeface and printing them on easy to use sticker paper. I am a big fan of primary colors, so the labels are printed in classic black, red, blue and yellow. Eva Moon Press Stationery Labels included in our Letter Writing Essentials. Do you have any advice to our readers for how to best use these labels? Color outside the lines, or stay within -- the choice is yours! If the label doesn’t fit your envelope, wrap it around the left edge of the front of the envelope so the return address is on the back. When mailing internationally, I like to add something airmail themed in the upper right; sometimes a vintage label, or a rubber stamp. I have yet to pass these labels through my typewriter, so that might be nice! A letter from Julia of Eva Moon Press to Kate of Of Note Stationers. Julia addressing and embelishing her envelope. What ephemera items do you enjoy collecting? I found my way into collecting when I inherited a couple of postage stamp collections two years ago and have added to the collection ever since. My postage stamp collection focuses on mid-century designs from Eastern Europe, back-of-the-book and poster stamps. My ephemera collecting interests ebb and flow, but I am always a fan of airmail, postcards of post offices and postal labels from around the world. I love researching items in languages I don’t read and learning about how they were used. As a designer, I am particularly drawn to interesting typography, illustrations and printing techniques which are often found on hotel labels, matchbox labels and seed envelopes. I also tend to collect architecture related ephemera, especially architecture having to do with World’s Fairs and the City Beautiful movement. Of Note Stationers getting busy with the Letter Writing Essentials.